So if this pup slipped his leash and I ran to help catch him, would that make me a “flat flat-coat retriever” retriever? Or if he were wearing a coat and it fell off, and I ran back to get it for his grateful owner, I would be a “flat flat-coat retriever” coat retriever, or, if I were wearing a coat at the time, perhaps a coated “flat flat-coat retriever” coat retriever. 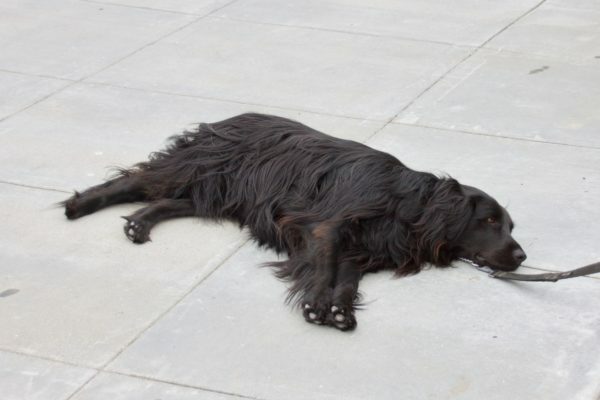 This entry was posted in Dog of the Day and tagged Flat-Coat Retriever, Ocean Beach. Bookmark the permalink.